Scorpion Types in the Southern U.S.
Eight-legged, long-bodied and stinger-equipped scorpions tend to prefer drier habitats in the South and Southwest, although a few species make their way farther north. Between 75 and 90 species occur in the United States, only four of which live east of the Mississippi River. Of the 90 or so domestic species, only one is potentially harmful to humans. Scorpions share several characteristics with their arachnid kin—spiders, ticks and mites. Their mouthparts are called chelicerae and their pedipalps are pincerlike and often long. Scorpions have distinctly segmented abdomens: the abdomens consist of 12 segments, the last five of which make up what is commonly called the tail. They also have a stinger attached to a bulb-shaped structure at the end of their abdomen. Several genera live in the Southern United States, including Centruroides, Hadrurus and Vaejovis. The genus Centruroides contains the most dangerous species of scorpion in North America: the bark scorpion (Centruroides sculpturatus). This species is small, reaching 1 to 3 inches long, and is found in California, Arizona, Nevada, southern Utah and New Mexico. Hentz's striped scorpion (Centruroides hentzi) reaches about 1.8 inches long. Centruroides contains two other Southeast species as well: the slender brown scorpion (Centruroides gracilis) and the Guiana striped scorpion (Centruroides guianensis). The striped scorpion (Centruroides vittatus) may be the most frequently encountered scorpion in the United States, particularly in Texas. This somewhat large scorpion averages 2 3/8 inches long and its range includes Texas, Arkansas, Louisiana, Mississippi and northward into Nebraska and Illinois. Several species in the genus Hadrurus, the hairy scorpions, also call the Southern U.S. home. 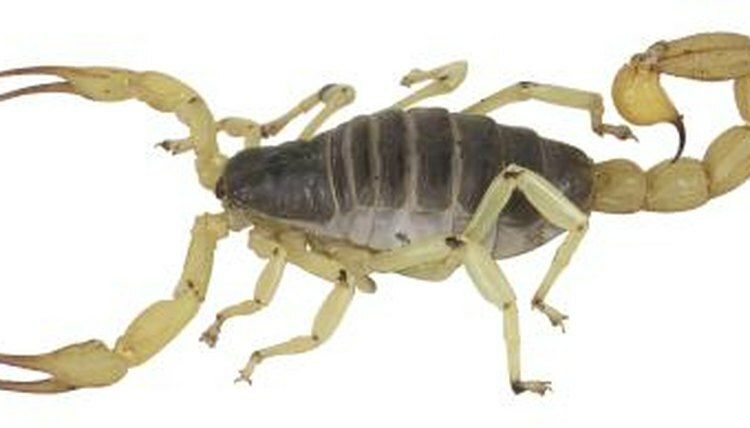 The desert hairy scorpion (Hadrurus arizonensis) reaches up to 5 inches long, much larger than most other U.S. natives. Three subspecies of Hadrurus arizonensis occur within the United States. Other Hadrurus species include Hadrurus obscurus, Hadrurus pinteri, Hadrurus concolorous and Hadrurus spadix. The genus Vaejovis, known as the devil or stripe-tailed scorpions, has several species occurring throughout the South and West, including the Southern devil scorpion (Vejovis carolinianus), which is the only species known to inhabit the state of Kentucky. This is the largest genus in North America and the third-largest in the world. Other species in include Vaejovis confusus, Vaejovis puritanus and Vaejovis spinigerus. What Are Three Types of Arachnids Besides Spiders? How Does a Scorpion Find Its Home? What Is the Difference Between Pseudoscorpions & Real Scorpions?